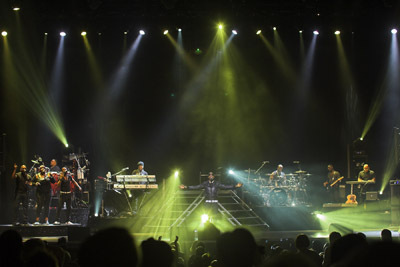 Dave Lee created the lighting, set and production design, working to meet an initial brief from Lemar’s management, which called for a dark and moody ambience. The front truss contained 10 fixtures — Robe ColorWash 750 AT Tungstens — used for keylighting and washing the stage. It was the first time Lee had used them. The mid truss was used primarily as a kabuki reveal. Lee had six Robe ColorWash 1200E ATs positioned on it, which he used for audience illumination. “I specifically wanted something different from blinders,” he said. The back truss was loaded with 10 Robe ColorWash 1200E ATs and eight Robe ColorSpot 700E ATs. These produced an array of moving beams and upstage backwashes. HSL changed some of the gobos for Lee, who uses double gobos to create custom looks. The tour used six vertical truss towers, at heights of 5, 8 and 10 feet. The 5-foot sections were towards the middle of the stage so as not to obscure a 10 by 5 meter SoftLED backdrop, also supplied by HSL. This had a portrait-sized MiTrix LED screen in front of it, onto which was beamed an I-Mag camera mix cut by Tom Levitt using content from an Arkaos media server — all supplied by XL Video. Rigged on top of each of the trussing towers was a Robe ColorSpot 700E AT, and spread across all six towers were eight PixelLine LED strips and 12 2-lite Moles, which were ensconced inside the trusses and used for emphasizing gentle punctuations in the music. Five more Robe ColorSpot 700E ATs were used to backlight the musicians, positioned in front of the set risers. Lee ran the show from his own Hog iPC console, working alongside lighting tech Dom Crookes.